Everyone from the EPA to the American Lung Association has stressed the importance of indoor air quality. Indoor pollutants don’t just impact personal comfort, they can often cause or exacerbate health conditions. Some researchers have even called for greater effort to monitor indoor air. Fortuitous, then, that Neatmo has released the Healthy Home Coach ($100). 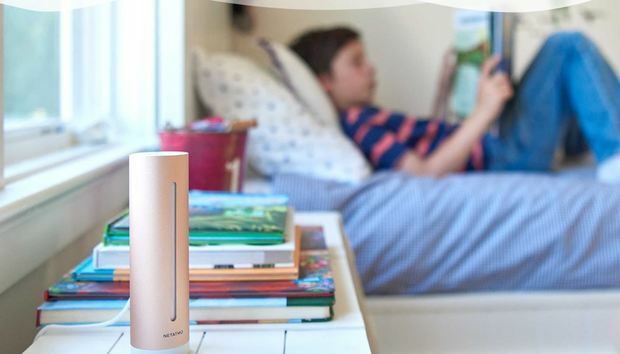 This device monitors your indoor climate in real time to help you create the optimum environment whether you have particular health requirements, such as allergies or asthma, or just want greater comfort. The Healthy Home Coach follow the same design cues as the Neatmo Welcome home security camera and the Netatmo Home Weather Station. It’s a 1.77 x 1.77 x 6.1-inch cylinder with a champagne-colored aluminum finish. There’s a single vertical light bar on the front that illuminates when the device is taking a reading. The Healthy Home Coach is easy on the eyes—certainly more so than your typical home hydrometer or thermometer—and can be placed inconspicuously on a shelf or end table. The Neatmo Healthy Home Coach helps you create a more comfortable indoor climate. The device doesn’t have a display; all monitoring data is communicated through the Healthy Home Coach companion app. The Coach tracks and records air quality (CO2 level, but not the presence of the far more dangerous CO), humidity, temperature, and noise levels in real time. As it gathers data, it recommends changes you can make to improve your environment in these areas. It also features profile settings that adjust its sensitivity for babies or people with asthma, as these populations have different ideal environments than healthier adults. The Healthy Home Coach also works with Apple’s HomeKit, so you could set it up to trigger your home’s smart AC when the temperature rises above a certain level, for example. I couldn’t wait to try out the Healthy Home Coach. My dwelling was built 55 years ago and has many of the inefficiencies of its era: single-pane windows, poor insulation, and gaps around door frames. Drafts and condensation are constant issues this time of year, and outside dirt and dust find their way in year round through a couple of ill-fitting sliding-glass doors. I was anxious to see if the steps we’ve taken to manage these problems were working. It was a breeze setting up the Heathy Home Coach. You just plug it in with the included power cable and open the Healthy Home Coach app. Once it detects the device, it walks you through the process of joining your Wi-Fi network. The whole operation takes about 4 to 5 minutes. You can tap at-a-glance readings for more detailed information. I decided to place the Coach in our master bedroom first. We had a long standing high-humidity problem there—we believe, in part, due to sealing issues with a sliding glass door that leads to a balcony—that several years ago culminated in a mold outbreak in the closet. We have the humidity under control, but I still keep a tiny hygrometer in the room to keep an eye on it. Within minutes after placing the Healthy Home Coach in the room, I had my first reading. The app provides an overall environment quality “grade” (i.e. “Fine,” “Healthy”) and at-a-glance readings for each of its four measurements. Clicking on one of the measurements opens a window explaining its importance to a comfortable climate and plots the reading along a colored bar denoting the value range for that measurement. Healthy Home Coach alerts you when measurements veer our of the optimal range. The Healthy Home Coach app saves all your readings, so once you’ve amassed several you can review them for insights. Tap the rewind icon in the top right corner of the app and it opens a scrolling timeline across the bottom with an hourly history of your climate results. Once I was comfortable with the bedroom environment, I moved the Healthy Home Coach downstairs to the living room. While the air quality, temperature, and humidity readings were all within normal range, this room had a moderate noise “pollution” problem. That’s hardly surprising since it’s the center of activity in our home and I would expect to see the decibel level rise once my kids were home from school. That really sums up my experience with the Healthy Home Coach—it does its job but it really doesn’t tell me anything I don’t already know. By the time the temperature, humidity, or noise creeps into one of the “red” zones, you’ll know it if you’re in the home. Do you really need a $100 instrument to confirm it for you? Even if you do, to call this a “healthy home” device is misleading. The conditions it monitors impact your comfort, to be sure; their affect on your health is debatable. Healthy Home Coach can tell you a room’s humidity levels are ripe for mold growth, but it would be a lot more helpful if it could detect mold spores in the air. The device worked well as far as it went, but I couldn’t help wanting more detail on the types of pollutants that might be lurking in my home. Without that kind of utility, Healthy Home Coach feels like little more than a curio.